I took this photo of Hugh Morson High School with my Kodak Instamatic in late February, 1966 — the beginning of the end. As we move into a new year, many of us can’t help but to think about old acquaintances and reflect on things past. A beloved friend I’ll never forget was Hugh Morson High School. In 1923 the Raleigh school board hired Atlanta architect C. Gadsden Sayre to design four modern school buildings. These were Hugh Morson High School near Moore Square, Washington High School for African-Americans on the southern extension of Fayetteville St., Wiley Elementary School on Saint Mary’s St. and Thompson Elementary School on Hargett St. 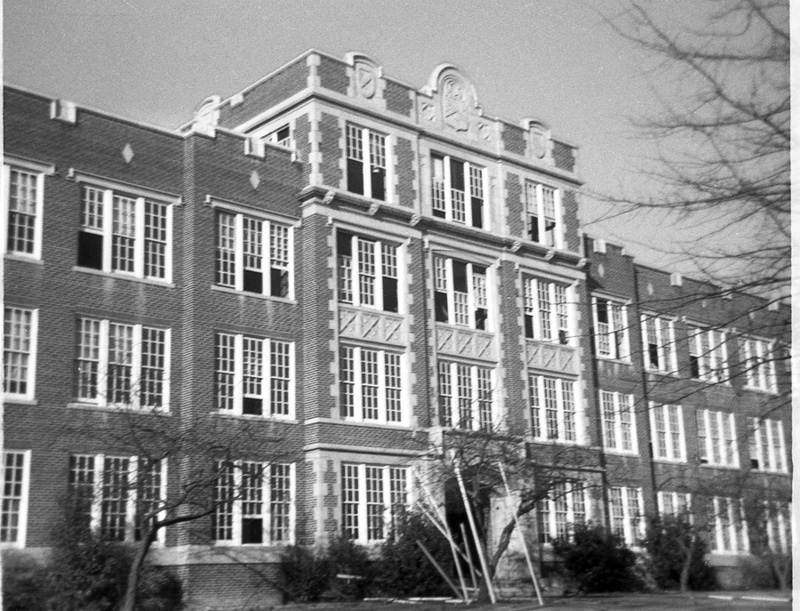 The high school was named after long-time Raleigh educator Hugh Morson. He had run the Raleigh Male Academy during the late 19th century, and became the first principal of Raleigh High School when it opened on W. Morgan St. in 1908. Beautifully designed in the Jacobethan style of architecture (aka Collegiate Gothic) popular for school buildings of the time, Hugh Morson High School sat impressively in the center of the block bounded by Hargett, Person, Morgan, and Bloodworth streets. It was delightfully embellished with limestone and terra cotta ornamentation, and was a proud showcase for the city of Raleigh. I attended Hugh Morson in its final years, 1963-1965. 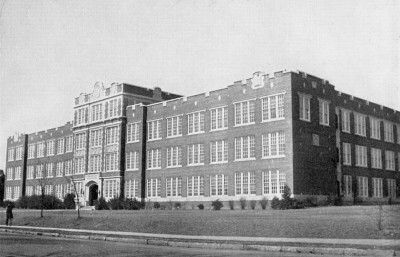 It had been demoted to junior high school status in 1955. I was a student there when Kennedy was assassinated and during the time school segregation ended in Raleigh (we had a single African-American in the entire student body in 1965). And Morson was where I got into my first teenage fistfight, and, sadly, lost a good friend because of it. 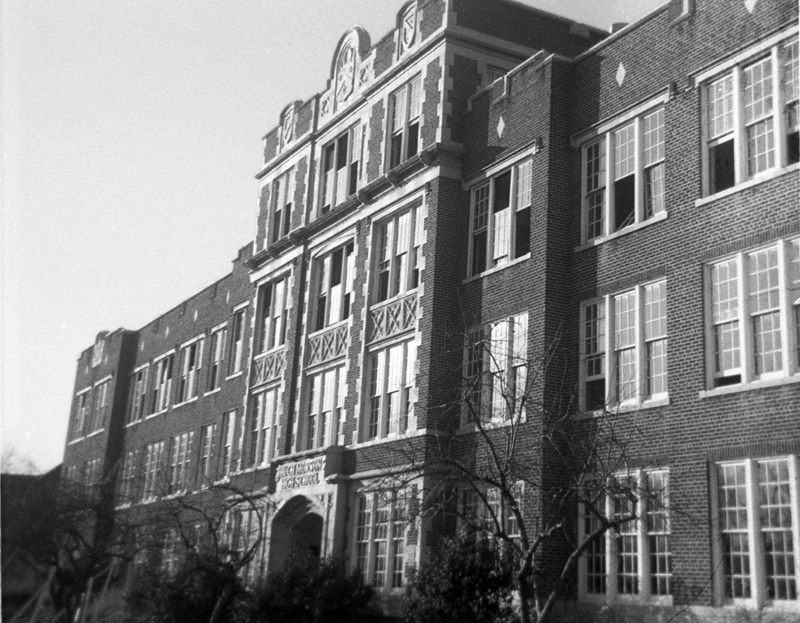 Over Christmas break in 1965 we 9th graders were transferred to the new Aycock Junior High, and old Hugh Morson closed forever. 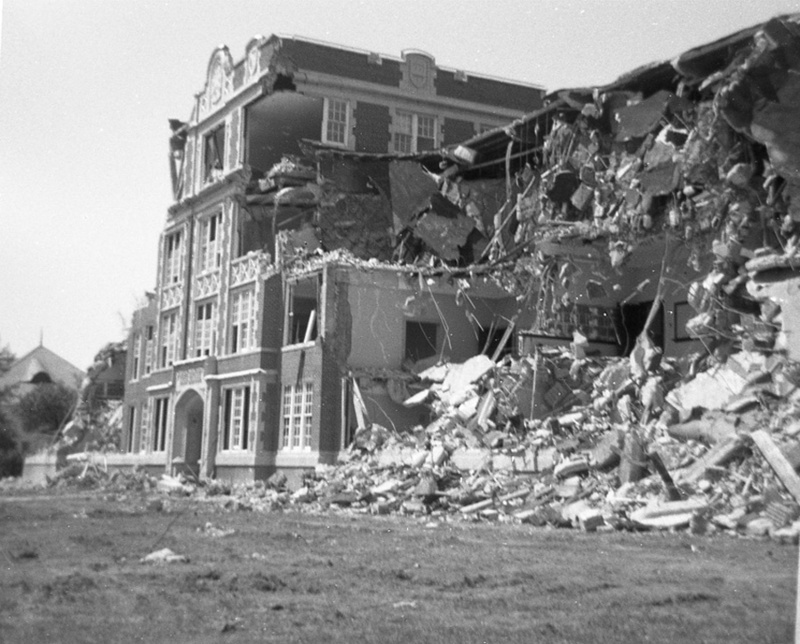 The building was subsequently demolished during the spring and summer of 1966. 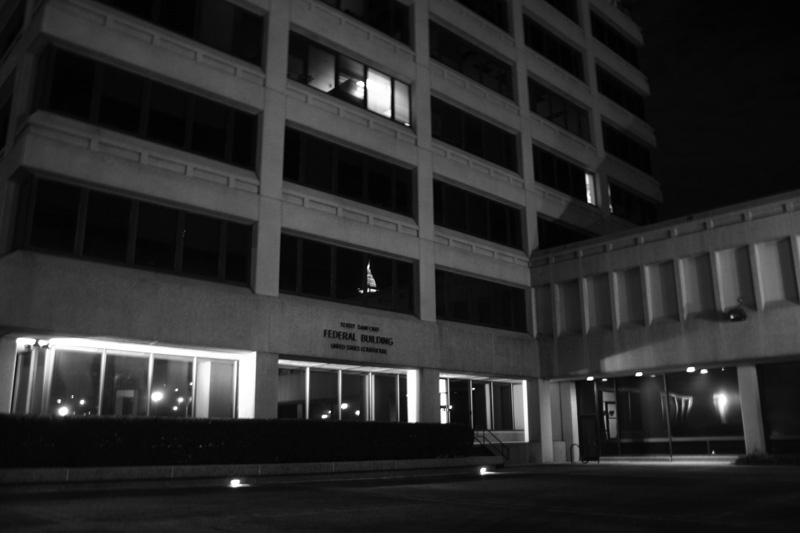 Within a couple years the Terry Sanford Federal Building was built on the site. Although I was only 14 at the time, I had fallen in love with the old building during my two and a half year tenure there. 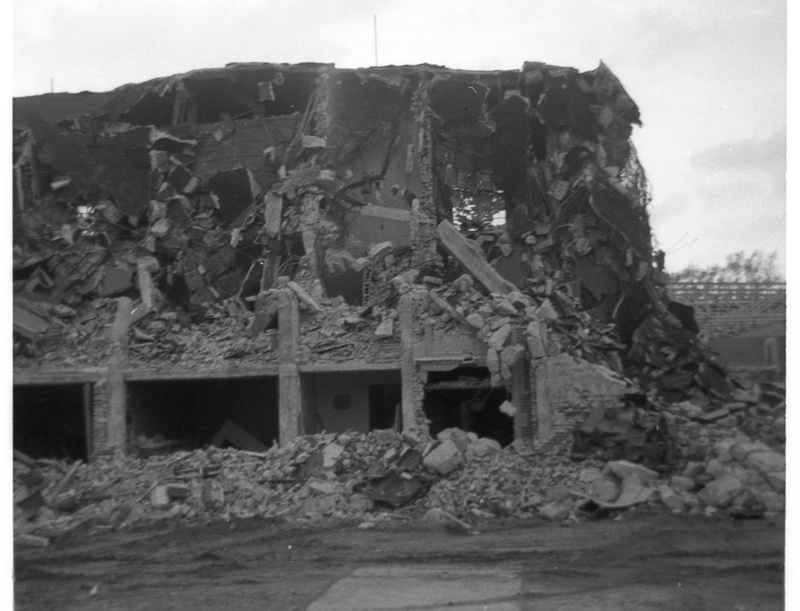 After I learned of its imminent demise, I felt compelled to chronicle its destruction. Over the course of the next few months I visited the site on weekends whenever I could get downtown, and took these photos with my trusty Kodak Instamatic camera. Ultimately, I took 32 photos, most of which I have published here. 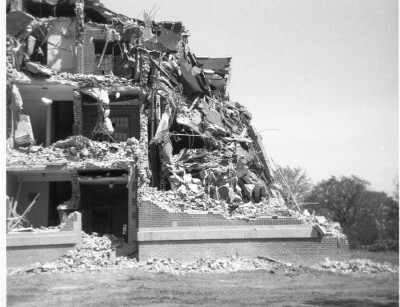 I remember the building’s demolition as if it were yesterday. 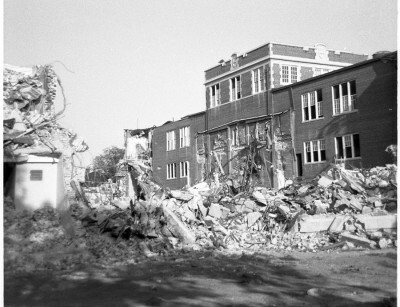 To our Goodnight Raleigh readers, then, I present my photo narrative of the last days of Hugh Morson High School. Another shot from February 1966. 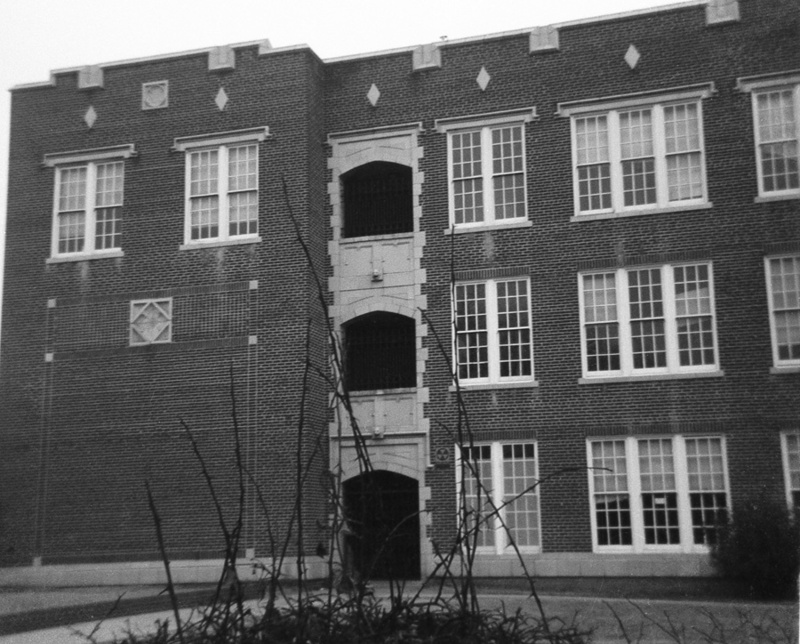 Exterior stairwells were located at each of the four corners of the building. When it rained, the water would pour through the open portals. There were two lion’s head gargoyles built into each stairwell that drained the water out. Herr Howard taught us 9th grade German in the classroom seen to the right of the ground floor portal. 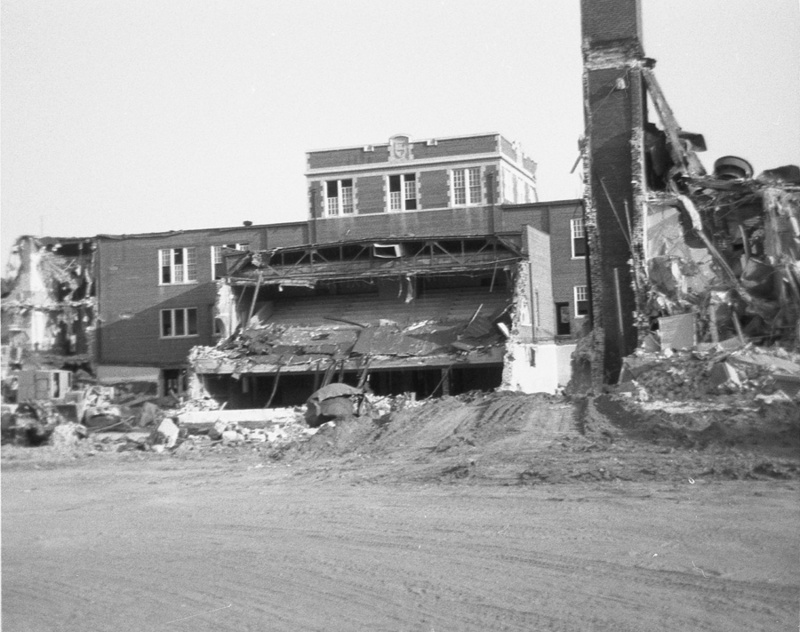 This photo of Hugh Morson High School was taken in early March, 1966, just after demolition began. 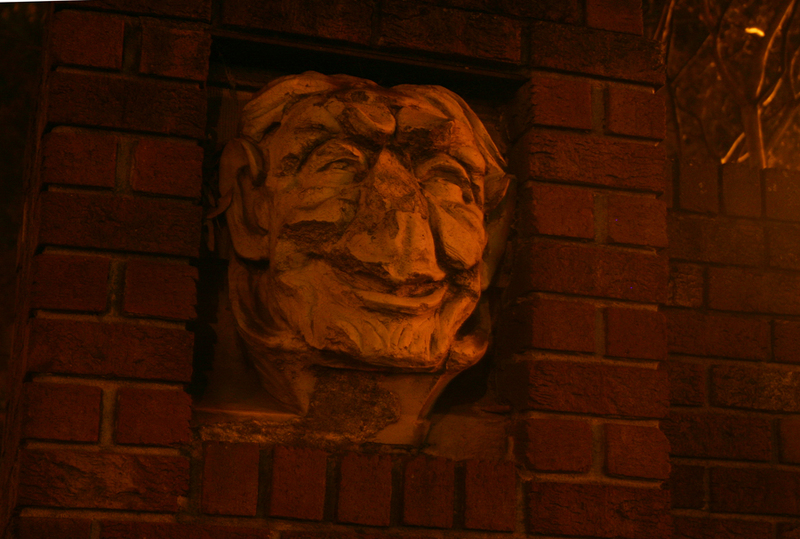 The six large humanoid gargoyles that graced the facade can be clearly seen above the third floor. I distinctly remember their ominous faces staring down at me as I would enter the massive front door archway. The same viewpoint a few weeks later. 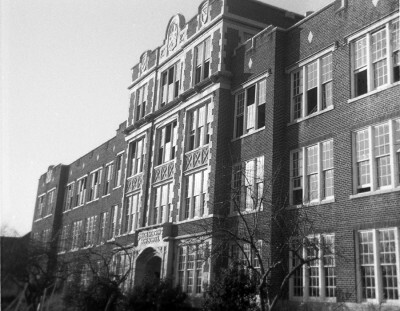 This is another view of the front of Hugh Morson, taken in early March, 1966. By mid-March the imposing main facade had been heavily battered. Mrs. Oswald taught us 7th grade math in the classroom seen on the far right first floor in this view. This is how it looked a few weeks later. After I took this shot, I began to feel brave enough to enter the building itself. I explored wherever demolition debris did not hinder my path. I tried taking photos inside, but without adequate light and no flash, sadly, nothing came of the attempt other than woefully underexposed negatives. 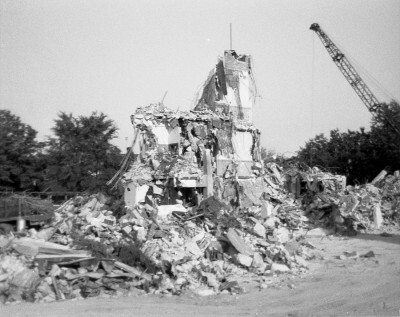 An enormous crane was brought in to do the dirty work of demolition. A giant weight hung from a cable attached to end of it. 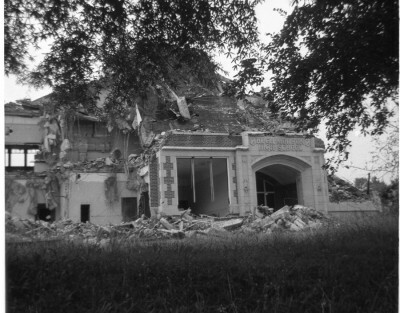 The photo below, taken probably in late June, 1966, shows that crane. My heart was broken to see my beloved school in this condition. Even after all this time, it still breaks my heart today. On the fourth floor was the band room, as we called it. Music and art were also taught here. The photo above was probably taken in late March or early April, 1966. By now, at this stage of demo, only three gargoyles remained in position– the others lay strewn about the debris on the ground below. I was in Miss Perkins’ 7th period music class in this room on November 22, 1963 when our principal, Mr. Proctor announced over the PA system that President Kennedy had been shot. Demo progresses on the southwest stairwell. You can see the lion’s heads water drains above the first and second floor portals. There was no fence surrounding the demolition site (nor at any other demo site I explored in Raleigh back then), so access was unencumbered. I remember one Saturday in the later stages of demo as I was rummaging around, I saw several battered gargoyles lying about the grounds. Hmm, I thought– why not! I managed to snag one of the lion’s heads. I have not seen it since I left home for college, and, sadly, I have no idea what ever became of this artifact. I wish I’d had the forethought back then to collect more. By mid-April, the southwest stairwell was barely recognizable. More of ‘Berlin’ — this shows the west side of the building. This is a view of the rear of the building, probably in mid-April. Behind the enormous arched windows was the yellow-tiled gymnasium. After the gym was cleared, demolition began on the auditorium. This view shows the job almost complete. The large cleared area seen here was the cafeteria. 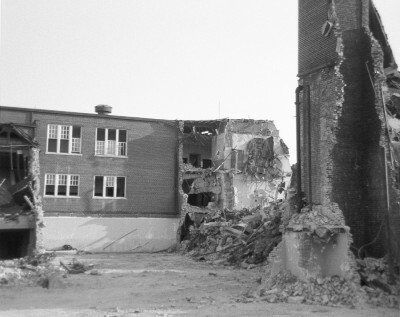 By mid-June, or so, the back of the school was gone. Only the imposing furnace room chimney stack remained for a little while longer. Nearing the final days of Hugh Morson High School — The imposing battering crane can be seen at the right, amid the rubble. 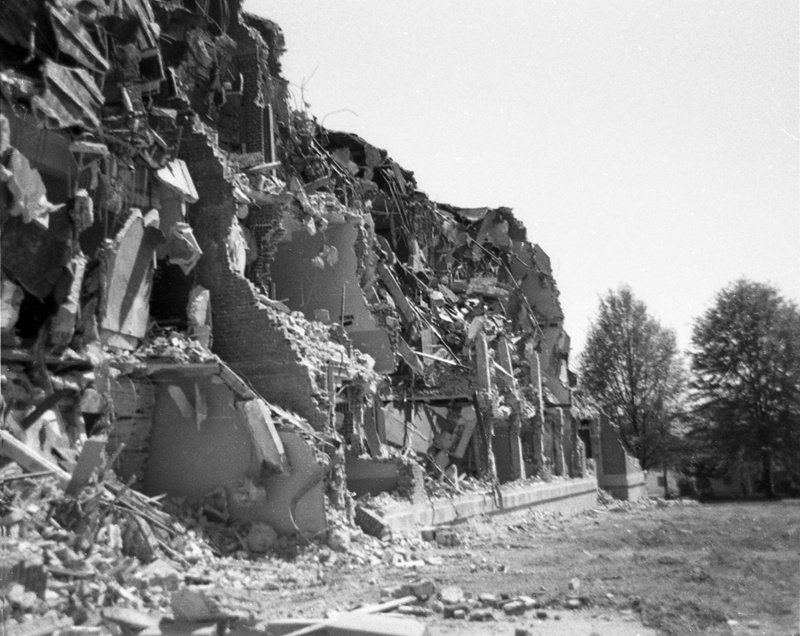 This is how the the main facade appeared in early summer, 1966. This is the last photo I ever took of Hugh Morson with my trusty Kodak Instamatic camera. 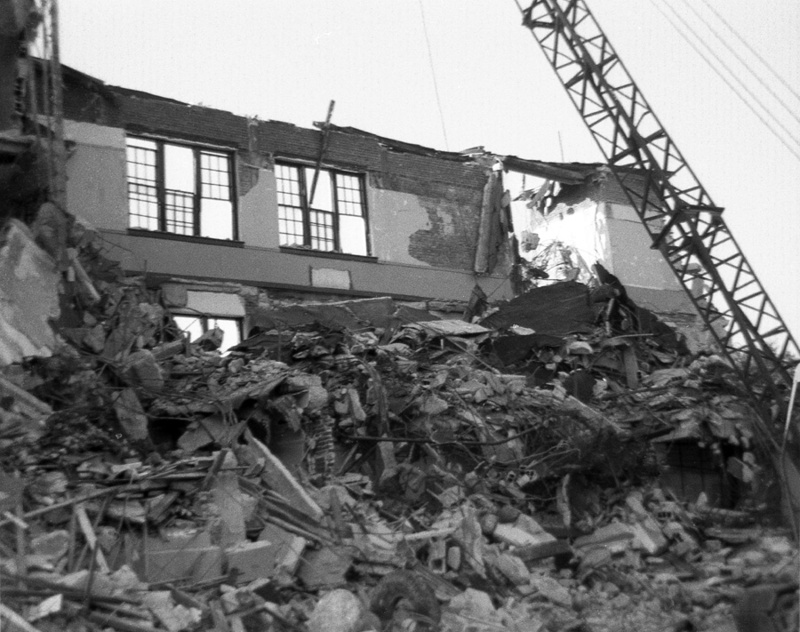 By the time I was able to revisit the site a couple weeks later, every trace of the building was gone. 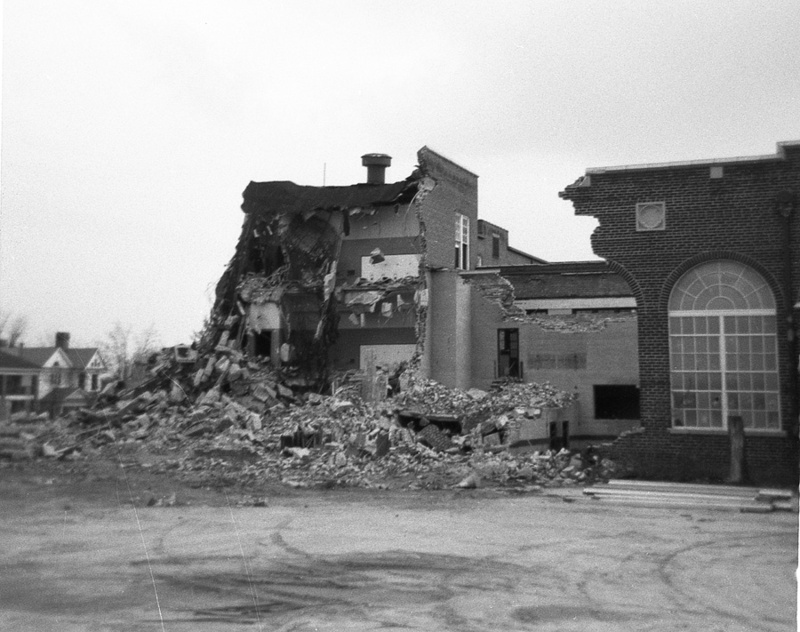 Nothing remains of Hugh Morson High School today except memories — and photographs. 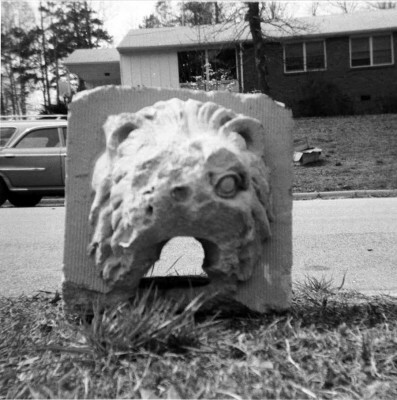 I had always thought nothing had been salvaged from the wreckage, except maybe my now long-lost lion’s head water spout. I’m certain even all that brick was hauled unceremoniously to the dump. 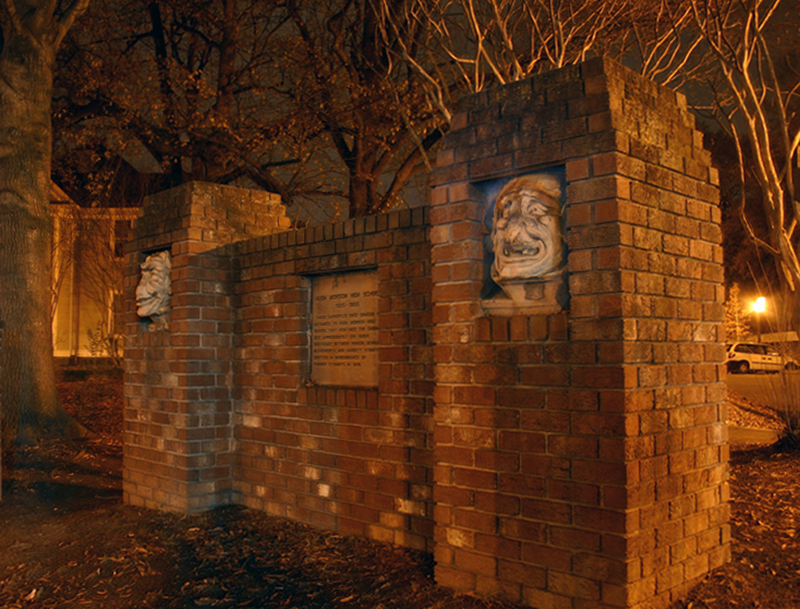 Happily, though, years later, two of the humanoid gargoyles resurfaced, and were enshrined in 1978 in a monument to the fabled school at the Morgan-Person St., New Bern Ave. intersection, across from the federal building. These mournful creatures are now forever reflecting on times past. Does anyone have a copy of the floor plan for Hugh Morson? I remember that the cafeteria was on the ground floor in the area surrounded by the classroom halls that ran 3 stories high. There was an open courtyard outside cafeteria on the South side of the building. 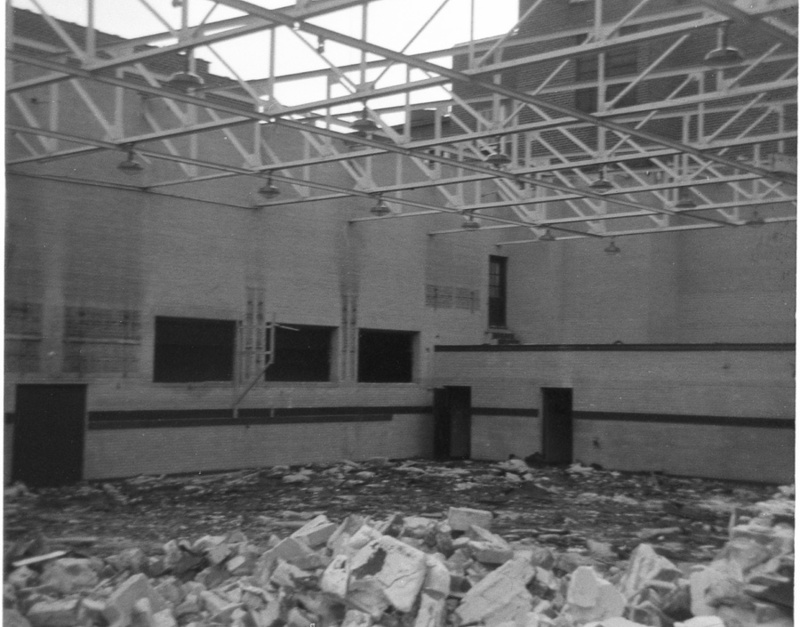 The Auditorium was directly opposite the main entrance on Hargett Street. 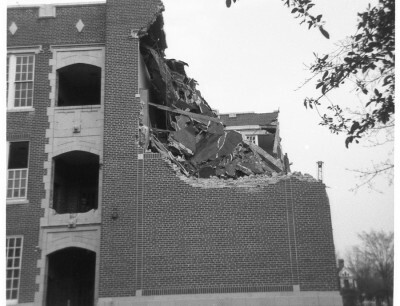 The gymnasium was on the North side along Morgan Street. The industrial arts shop was on the East side of the central core with one wall shared with the cafeteria and auditorium, IIRC. What I cannot remember is the arrangement of classrooms on the 3 floors. 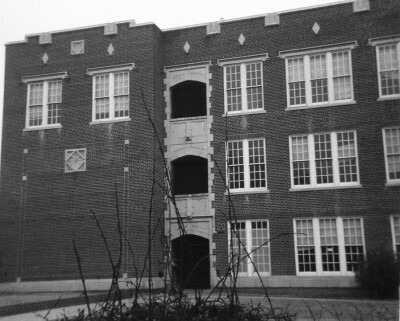 The band room was on a fourth floor directly above the Hargett Street entrance and I believe Mrs. Wood taught voice in the classroom beneath on the third floor when I was there from ’55-57. Principal’s office was the first door on the left as you entered from Hargett Street and the boys and girls counselors were the next two offices. I do not remember is there was a room dedicated to drawing and art. If anyone has a floor plan or know where I can veiw one online, I’d be very grateful for the information. Jimmy Ayers and Robert Hutchins, thank you so much. Anything would be much appreciated. I have an ancestry.com account but have found nothing. I’ll try to see if I can make out the year on the ring, most of it is fairly smooth. I’m hoping maybe she had some siblings in attendance with her during the years she was there, but I wouldn’t know where to begin with their names. If the yearbooks reveal anything I will give you my e-mail address at that time. Thanks! R. Johnson, more information would help to find Rachael Edwards. Not a totally uncommon name. Anyway, in 1930 there was a Rachael Edwards, age 5, living on Summit Ave. She is living in the household of Alis W Edwards, age 30 (male), who is a widower. Also listed are his other children: Louise, James, Mary, and Dortha E.(Dorothy?) In 1940 most of the family is living at 514 S. Harrington St. Rachael, age 16, is in her first year of high school. Living in the household are: Alex W (head) age 40, his wife Floy S age 47, James, Dorothy, and Rachael. I found a death certificate for Alex W Edwards born 1899 in Aberdeen, died 1952 in Raleigh. The informant on the COD was Floy Olive Edwards. Alex is buried at Swift Creek Baptist Church. Perhaps this is the family you are looking for. did graduate that year. In fact she signed his album. He does not have a computer. I’ve asked him to have his daughter scan the page and email it to me. He might not remember to tell her, though. Thank you so much! This is a huge leap for me as she was a dead end in my family search, through her side anyways. Hopefully I can get some more information now that I have this to go off of. I’m assuming the spelling above is the correct spelling of her name. I know that I was named after her, but my spelling is Rachel, if I know that the above is correct it may aid in my search. I hope that your brother can remember to ask his daughter to do me such a grand favor. I would love to see what she wrote as well as any pictures. I found a copy of the 1942 Oak Leaf on E-Bay, but I don’t trust that it is the real thing so I didn’t want to spend that money if I didn’t have to. Again, thank you so very much, it means a lot. I attended Hugh Morson for 8th thru 12th grades (graduated 1950). Super environment and great teachers. As I recall, during those years there were two (white) high schools in Raleigh – Hugh Morson and Needham Broughton. Each school had its own basketball team (bitter rivals) and combined for the Raleigh High football and track teams (I played on both when I wasn’t on probation for my grades). I moved to the Washington, DC area in the early 1960s to work on government contracts — on a later visit to Raleigh I was stunned to see the new Federal Building in the place of Hugh Morson. Very sad! Great history — thanks. 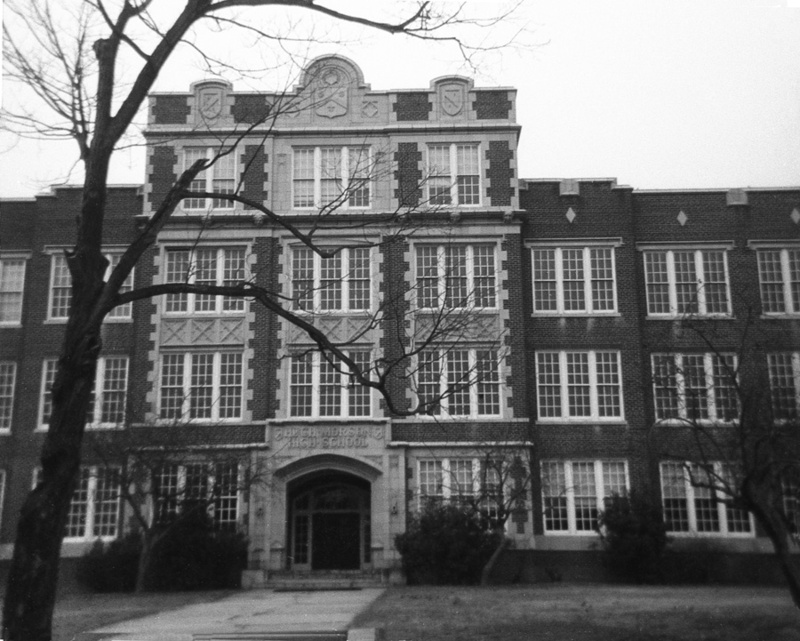 I went to Hugh Morson for 5 years (8th grade was there then)as did my 3 brothers–Eugene, Willie and Carroll. I graduated in 1950. 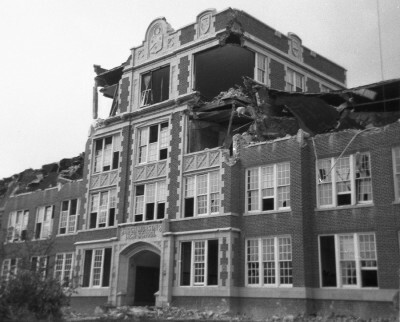 Seeing all these pictures made me cry to see that wonderful school demolished. I had a wonderful Chemistry teacher Mr. Gordon Smith. He made Chemistry so interesting and so much fun especially the Lab part. From that experience I decided to become a Lab Technologist and trained for that and worked in a hospital clinical lab for 35 years and enjoyed my career so very much. I truly have him to thank. I wish I could have let him know how much I appreciated what he did for me. I thought a lot of Mr. Burt the band teacher. He was great and friendly to all. 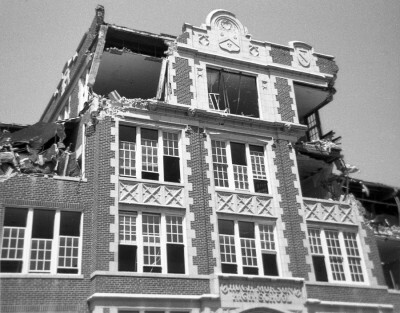 I remember that 4th floor band room and those windows were scary as I was always afraid someone might fall out as the floor was built up to the windows. Thanks Raleigh Boy I just loved your pictures and your write-up as it brought back many pleasant memories. Ann Johnson, thank you for your comments, and thank you for sharing your delightful recollections of our beloved school with us. I, too, had several teachers at Morson who left an indelible and life-long effect on me. And yes, those windows were so very tall! I am so grateful for some referrals to ebay which came to me through this site and which lead to my recently acquiring a 1929 edition of the Oak Leaf annual, which was my mother’s graduating class. I believe she may well be the oldest living Morson graduate (102 this coming October) and, although her mind is rather cloudy at this point, she definitely shows some glimmers of recognition when she is shown this book. It is a real treasure. Have a 1937 Oakleaf year book with Rachael Edwards name listed as a sub-freshman class. There is a picture but the people are not named. Not sure if that is any help. My husband has a 1927, 1937 and 1952 Oakleaf. His name is William Holt Lewis, Jr. or Bill Lewis. I never saw Hugh Morson school, having only been born in 1964, but your demolition photos break my heart .. imagine how many lives were formed in those hallways. How wonderful that you had the presence of mind to document HM’s demise; what a tragedy that the building didn’t survive to enjoy downtown Raleigh’s renaissance. Thanks so much for sharing these haunting images. I was the president of the Hugh Morson High School class of 1954. Our classmates have remained close friends and meet monthly for lunch. We have a 60th reunion coming up in August. We were all fortunate to have gone to school there. Members of the classes just before and after us are dear to us as well. I spent many hours in the Band room, and Millard Burt was very important in my life, with his doctoral thesis and placement/preference program. Farmer Smith was a wonderful man. I worked in his office for one class period as a senior. Mrs. Creighton, who died between my junior and senior years, was without question, the best teacher I ever had, including college and law school. We had a truly classless society in school, where it did not matter what your parents did, or how much money they had, but you were judged by your classmates based on your own worth. I think the Bar-B-Q restaurant on South Saunders Street in the ’60s was Sauls. Love Old Raleigh. 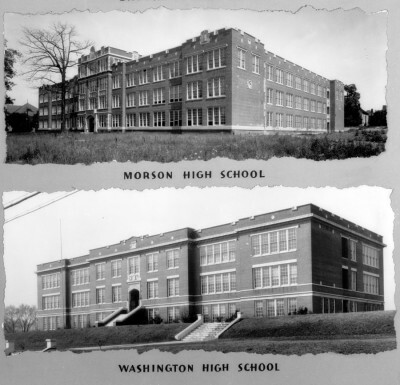 I attended Morson Jr. High for the seventh grade, before Enloe opened. 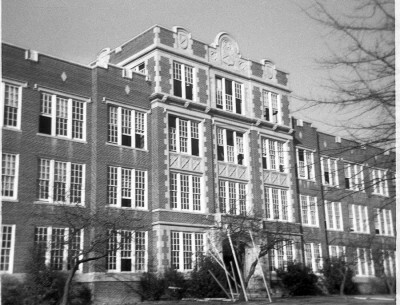 Enloe opened the next year and was a Junior High and High School until Aycock Junior High Opened. So, I attended Enloe for five years, grades eight through twelve, graduating in 1967. Mrs. McGee and Mr. Sanders were my two seventh grade teachers. At that time, we had a morning block and afternoon block of classes with only two teachers. I still recall playing softball at recess and junior high basketball for Coach Sexton. I also recall going across and down the street to eat at Watkins Grill, on Person St., after playing basketball at Morson on Saturday mornings. I didn’t realize Morson stayed open as long as it did. I left for Enloe when Enloe opened in 1962. I lost touch with Morson and just thought it had closed shortly after. I vividly remember losing our first junior high basketball game and going into the locker room, crying. Coach Sexton came in and put his hand on my shoulder, smiled and told me it wasn’t that bad and we had more games to play. He was a tough but caring and understanding coach and man. I think he’s in a nursing home in Raleigh currently…at Brighton Gardens. I’m going by to see him! I was one of the fortunate students to be in that last 9th grade class at Morson. We went to Morson until the Christmas break of 1966 and then transferred to Charles B. Aycock and become the first graduating class there. What I noticed at Morson was how worn the stair treads were. I believe the were granite and they were cupped from all the years of students wear and tear. A family friend, Mr Bobby Oakley built that monument pictured. He donated his time and crew and used the original Gargoyles from the Morson building. I started the 7th grade in 1955 and finished the 9th in 1958 at Morson.That was the first year that it was a Junior Hi. I was vice president of the student council in the 8th grade.I played football,baseball and basketball while I was there. Many fond memories and lifelong friends from those 3 years. I am happy to note that my mother (known in her Raleigh days as Rex Layton)(Class of 1929, Hugh Morson High)is set to turn 102 next Tuesday). Although her mind continues to be quite cloudy, she is nonetheless still very cheerful and upbeat. Geoff Yorke — Please convey happy wishes from the editors of Goodnight Raleigh to your Mom on her 102nd birthday! Thanks for your kind wishes, Raleigh Boy; I will see that they are passed on to her. @Robert Hutchins, we were corresponding about 7 months ago about my grandmother who graduated in 1942, you told me at that time that your brother has a copy of the 1942 Oak Leaf and that my grandmother, Rachael Edwards was in that book and that she also signed his copy, would there be any possibility of obtaining copies of her pictures and her signature? I was the President of the HMHS Class of 1955. We were the last senior class to graduate from this grand old school. I really appreciate all of the remembrances all of you have listed. Aren’t you glad you lived in the time that you did? Yes, I will be happy to scan the info and email it to you. You need to contact Karl Larson (aka RaleighBoy) and ask him to give you my email address. I have sent a ‘contact’ message OK’ing the release but I’m a little reluctant to post it openly lest the spam scammers collect and use it. After you have the email addy, send me an email which will give a means to attach the scans in my reply. It’s great that you found this blog. You were in the class ahead of my sister, Nancy, and a couple of years behind my sister, Mary Jo. I think you also knew John and James, my brothers. In May of this year the last senior class to graduate from HMHS, the Class of 1955, will hold our 60th year Reunion. We are going to be “Lost in the Fifties Tonight”. Loved Hugh Morson High School-attended 8th through 10th grade – 11th and 12th grade sent to Broughton High School to graduate. Raised in Oakwood Area and lived 1 block from Murphy School. Spent first 7 years in Murphy school and knew it was on to Morson for the next 5 years to graduate. I was devastated when learned it would become a Jr. High school and we would not be able to graduate from there. Our first 3 years at Morson were great. We were well on our way. I had Cornelia Tongue in 8th grade. She was such a great teacher even bringing chocolate covered ants, grasshoppers from Europe for us to eat. I had Lynn Kerbaugh for American History and remember when he was held up by a robber with a screw driver as a weapon. He had a hard time living that down. Loved having Mrs. Wood as a Music Teacher as she was so colorful including her bright red hair. She made you love music and desire to sing in the choir. We had so many wonderful teachers.and I have beautiful memories in my heart. My real “hero “was Farmer Smith, Dean of Boys, who knew I wanted to go into Nursing and helped me receive a full scholarship from the Rotary Club. I graduated from Rex Hospital school of Nursing in 1960 and ended up taking care of him as nurse in ER.I was an Office Assistant for him for 3 yrs at Morson and 2 yrs. at Broughton. He knew how much I wanted to be a nurse. I owe it all to him because he listened and understood. I retired with 50 yrs. of Nursing in 2010. All of the faculty at Morson had the students best interest at heart. We were given so many opportunities to excel within the halls of Hugh Morson High School. 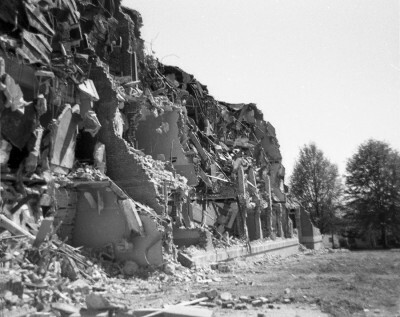 I loved the building and have never understood why they had to demolish such a beautiful,architectural structure on a historical site for the Federal Building to be placed on the property. It can never take the place of Hugh Morson High School. I will always be a Morson girl at heart. (Class of 1957) 2/25/15 SFB Ellis Beasley and I married 5 1/2 years ago so I have been privileged to attend the 60th class reunion for class of 1954, and the reunion of the 2 classes combined that graduated 1954,1955 and celebrated at the Villa Capri last year. My great grandmother, Ellee DeBoy(Ellee DeBoy Kennedy) graduated Hugh Morson around 1928.She married my great grandfather, James M Kennedy Jr. I have her picture from the yearbook, but thank you so much for the offer! My great grandmother died in 2000, but I can honestly say that of anyone I’ve known, she had the most positive and profound influence upon my life. She attended Peace College after graduating high school, my great grandfather attended N.C. State and Campbell university. He was the son of Raleigh architect James M Kennedy Sr. who designed the city market and various other buildings. They met at a debutante ball. It was an entirely different world in those days. We have apparently failed to get my email address to you through this blog. I own the Broughton1960.com domain name. You can contact email me at hutchins@broughton1960.com. I have the 1942 Oak Leaf annual that has your grandmother’s class picture and a note she wrote to my oldest brother. I will be happy to scan them and email the scans to you. Please contact me at hutchins@broughton1960.com. Leon Gray Sexton, 88, passed away peacefully on July 2, 2015. He was a loving husband, father, and grandfather. Leon was born on August 5, 1926 in Jamesville, NC. He graduated from East Carolina University and then moved to Raleigh to begin his career as an educator. Leon was a caring teacher, guidance counselor, and coach at Hugh Morson, Enloe High School, and Cary High School. He is still remembered today by many of the wonderful students that he mentored throughout his thirty six years in the teaching profession. Leon was preceded in death by his wife of 59 years, Becky Ainsley Sexton, by his parents William Sexton and Virginia Modlin Sexton, and by his brother William “Bill” Sexton. He is survived by his two daughters Susan Sexton Hoffman and husband Mark, and Sherry Sexton Warren and husband Miller; grandsons Bradley and Christopher Hoffman; and sister Shirley Pinner. Services will be private. The family will receive relatives and friends on Monday July 6th from 5:00-7:00 pm at Montlawn Funeral Home. Flowers are welcome or memorial contributions can be made in memory of Leon to Longview Baptist Church, 2308 New Hope Road, Raleigh, NC 27604. Coach Sexton was my baseball Coach at Morson in 1957..He taught ma a lot about life and baseball. Sad to hear of his passing. I am so glad that I discovered this blog. I taught 9th grade Englush/social studies and 9th grade drama for three years — 1960-63 — at Hugh Morson Junior High School. 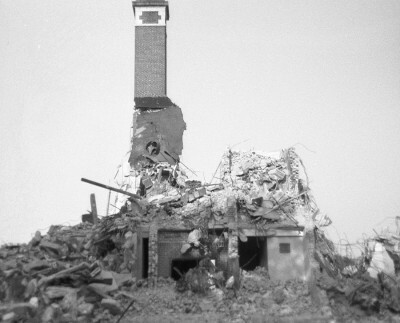 I was saddened when I looked at the demolition images. 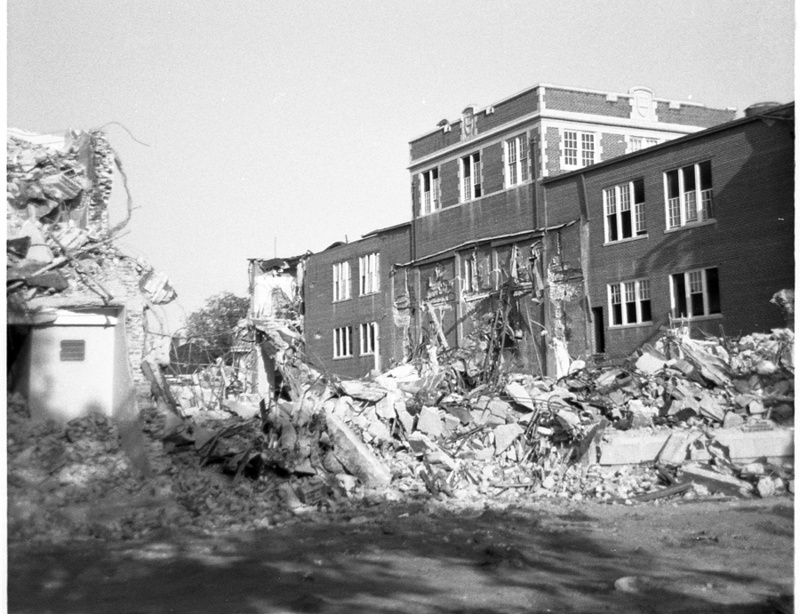 I left Raleigh in 1964, at a point when the school district was undergoing major changes. Even after so many years, I have some wonderful nemories of those three years! I left an earlier comment but forgot to verify that I would welcome any responses forwarded via my email. Would like to rectify my oversight. Hi: I live in Lansing, Michigan. I bought an antique notebook, clearly from the 1920s off EBay. Inside it said “Inez Elliott, Hugh Morson High, class 7B”. When I looked up the school on the internet I found your remarkable story and photos. Thank you for sharing this with us. I’m trying to recall you, but unfortunately, can’t! My bad! I was a student at Morson Jr. High (7th grade only) during the time you taught there. 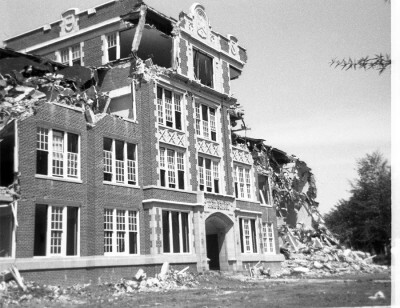 Enloe opened, and I attended 8th through 12th grades at Enloe, graduating in 1967. I didn’t see your email in your post, or I would have emailed you. My teachers at Morson were Mrs. McGee and Mr. Sanders. I have seen Mrs. (Linda) McGee many times since junior high. She’s married to a former FSU football player and has remained in Raleigh all these years…very nice lady. Best to you! I noticed a comment you had about Mrs. Woods music room. “What I cannot remember is the arrangement of classrooms on the 3 floors”. “The band room was on a fourth floor directly above the Hargett Street entrance”. Correct! 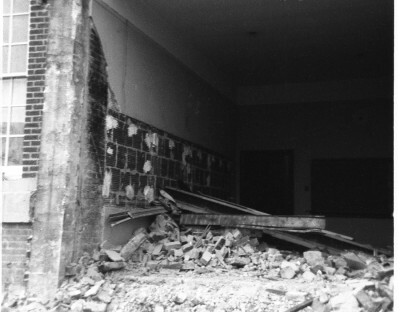 I think all class rooms were on the outside walls of the third floor. But I believe Mrs. Wood taught voice/music in the classroom next to the third floor boys rest room whose windows looking out over the playground facing Morgan Street on the northeast corner on the 100 block of South Bloodworth Street. I was there from ’53-55. Then off to Broughton. I don’t recall the 2nd floor having any class rooms on the inside.I thought like the third floor they looked out over the roof of the cafeteria, auditorium and the gym. What were the school colors for Hugh Morson Jr. High? I just came across some papers my father had of his daddy that went to this school. My grandpa name was Albert W. Grady. I found his diploma dated 1939. does anyone maybe have a picture of him from that year. I have always lived in Garner and never knew about the school until i came across this after my father pasted back in November 2018. please let me know.